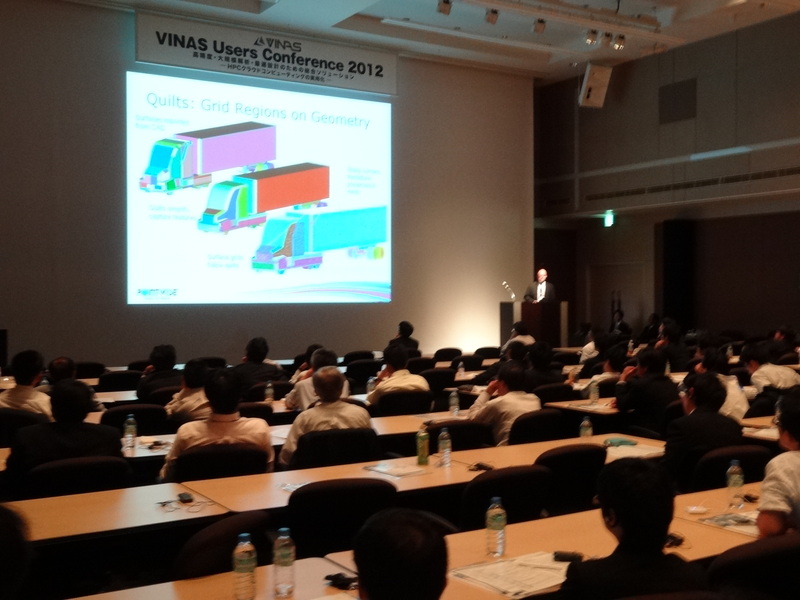 The VINAS User Conference 2012 was held in Tokyo on October 11th and 12th. VINAS distributes Pointwise software in Japan. That means they market, sell, and provide technical support for our products to customers in Japan. They also distribute software from Intelligent Light, CRAFT Tech, Convergent Science, Optimal Solutions, FE-DESIGN, Open Engineering, and TransMagic. VINAS also develops and markets their own linear equation solver, Super Matrix Solver. Pointwise presentation at VINAS User Conference 2012. Approximately 400 engineers attended the conference over its two days and two concurrent technical tracks, which covered topics from CFD (preprocessing, solution, and postprocessing), optimization for both fluid and structural performance, multiphysics, and high performance computing. Cloud computing was a special focus of the conference this year, and the keynote speaker was Khawaja Shams from NASA Jet Propulsion Laboratory (JPL) at California Institute of Technology. They use Amazon cloud computing services for processing images from the interplanetary probes they manage including the Mars rovers Spirit, Opportunity and Curiosity. Their projects start before the vehicle is launched, so they previously had to budget months and years in advance for the capital acquisition of the computers they would need. Additionally, their compute loads spike sharply when new images are downlinked and need to be processed, but then there are long periods in between when they are not used much. Using the cloud lets them configure compute resources as needed on the fly, giving them a more flexible and efficient computing setup. Another focus of the conference was high-performance computing (HPC). Several of the HPC related presentations showed very large grids. Dr. Hank Childs from the VisIT project at Lawrence Livermore National Labs showed computations on grids with more than a trillion cells, and Professor Chisachi Kato from the University of Tokyo showed some industrial CFD applications on two billion cell grids. They are running on massively parallel computers and using Cartesian grids, but still impressive. Dr. Yusuke Tahara from the National Maritime Research Institute of Japan showed his work on optimization of water jet propelled high speed ships using overset CFD techniques. Using overset grids simplifies regenerating meshes when the geometry changes during shape optimization while still resolving the high Reynolds number boundary layer around the ship. Dr. Mikhail Grigoriev from Cameron Compression showed their centrifugal impeller design system, which relies heavily on CFD. Cameron designs over 1,000 new impellers each year. Each design goes through at least one of four different levels of CFD simulation (from simplest to most complex): single blade passage with no diffuser, single blade passage with low-solidity diffuser, full unsteady impeller with dump diffuser, and full unsteady complete machine. The level of complexity used depends on how similar the impeller is to previous designs. The simpler analyses use grids automatically created by scripts, while the higher levels require more manual mesh generation. 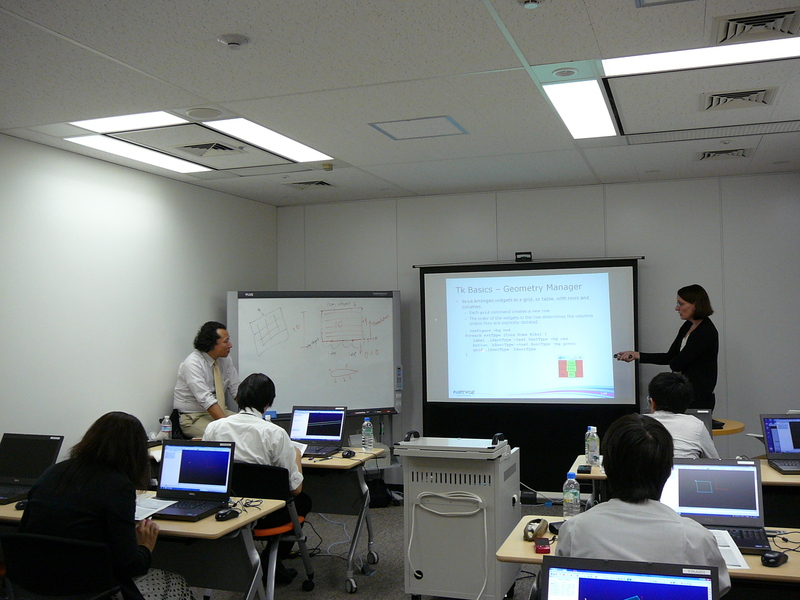 Carolyn Dear, with assistance from Yoshiyuki Sawa, teaching Glyph scripting in Tokyo, October 2012. The VINAS staff and I gave presentations on the latest developments in Pointwise, and Carolyn Dear, manager of technical support at Pointwise conducted two workshops in conjunction with the conference. One covered new features in Pointwise and the other introduced Glyph scripting. As always, the VINAS User Conference was an enjoyable and informative meeting. This entry was posted in Events, People & Places and tagged Glyph, mesh generation, Pointwise, scripting, VINAS. Bookmark the permalink.